When we got Donut, we were told she was an indoor cat. We wanted to give her the opportunity of going outside. After a few weeks, we left the patio door open. She eventually put two feet out then was back in. A few days later, she put all four feet out, then was immediately back in. It took a few months for her to be comfortable about being out and now she can't wait to get out! We have now had her for one year. She enjoys playing, especially with our old boot laces. We did try to think of another name, as initially we felt a bit daft calling out 'Donut', but in the end we decided to keep it. Donut was rather aloof to start with, but over the year, she has become more engaging with us and now sits next to us on the sofa and on the end of our bed. 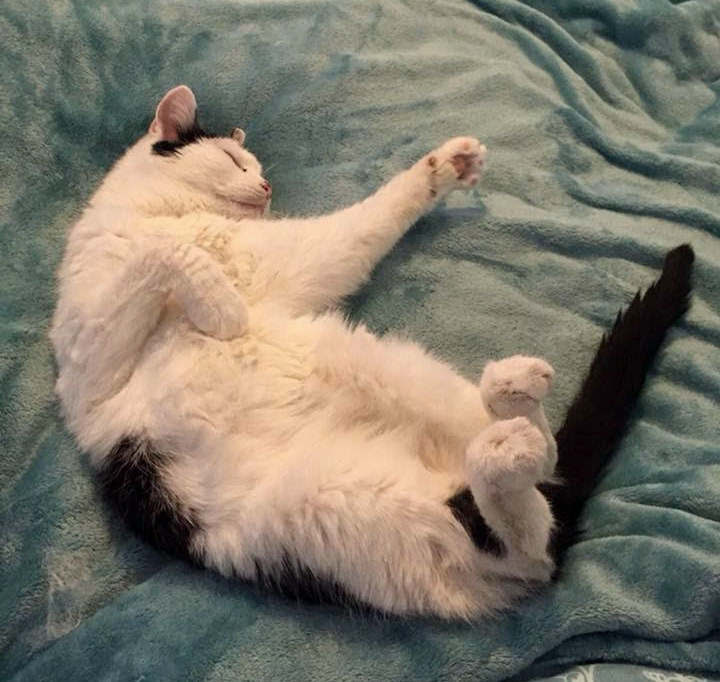 Donut definitely seems to have settled in well now and we are very pleased with our choice! When my husband and I purchased our first home we decided it was now the right time for us to get the cat we had wanted for years. 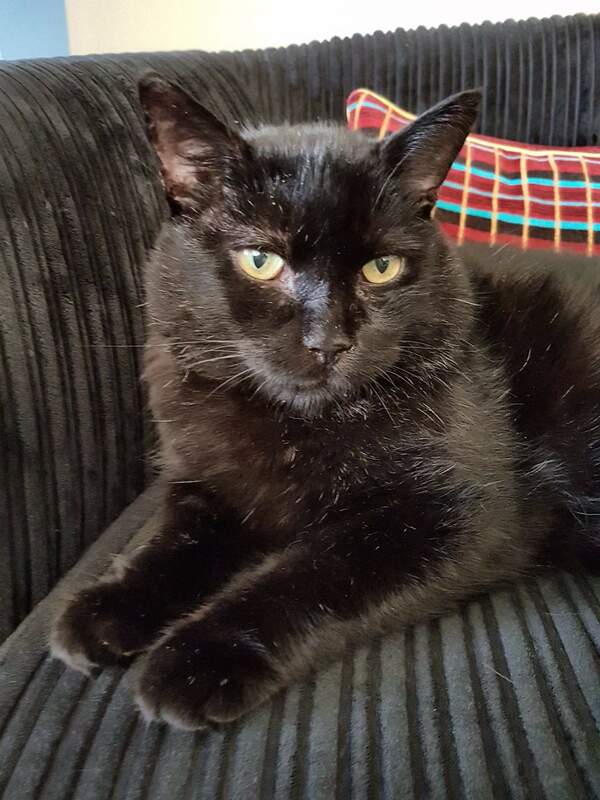 We made the decision that we wanted to adopt an older cat as we knew it was harder for them to find homes, it suited our lifestyle and we loved the idea of providing a lovely home for a cat to enjoy their golden years. 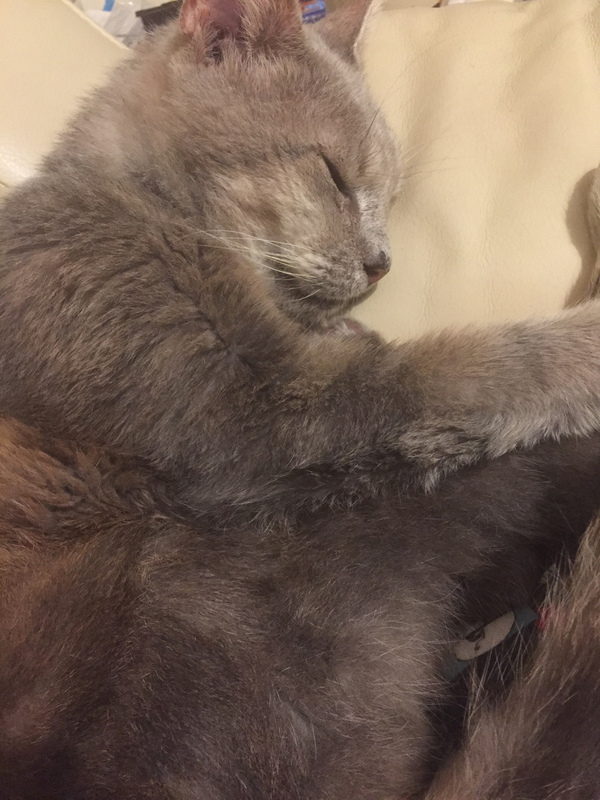 We decided to visit an older cat, Emmy, who was about 12 years old, we saw a video of her and she looked so sweet and very affectionate. When we met Emmy I fell for her as soon as I saw her; she was timid but showered us with affection. We visited on the Friday night and before we visited we had agreed that we would not make a decision on the spot and we would think about it over the weekend. But as we left I whispered to Emmy that I was coming back for her. I believe we had chosen each other at that stage. When we got her home we were prepared to let her settle in quietly and slowly but as soon as she came in she explored every room in the house and then settled herself in between us on the sofa! We were so pleased she seemed to consider this her home so quickly. Emmy has been with us for about three months now and every day she has grown in personality. Her favourite things are cuddles and being warm together. She loves a fuss and a lap, will chat to you all day long and has recently started to play. She is now very much the boss of the house! Everyone that meets her comments on what a gentle loving cat she is. People say to us that Emmy is lucky to have found her furever home with us, but we think we are the lucky ones to have found her. She truly is purfect for us! When we adopted Emmy we learnt she had spent the last two years living outside with no shelter due to not liking her owner’s new dog. The Cats Protection are an outstanding bunch of volunteers who without them it would not have been such a happy ending for Emmy. 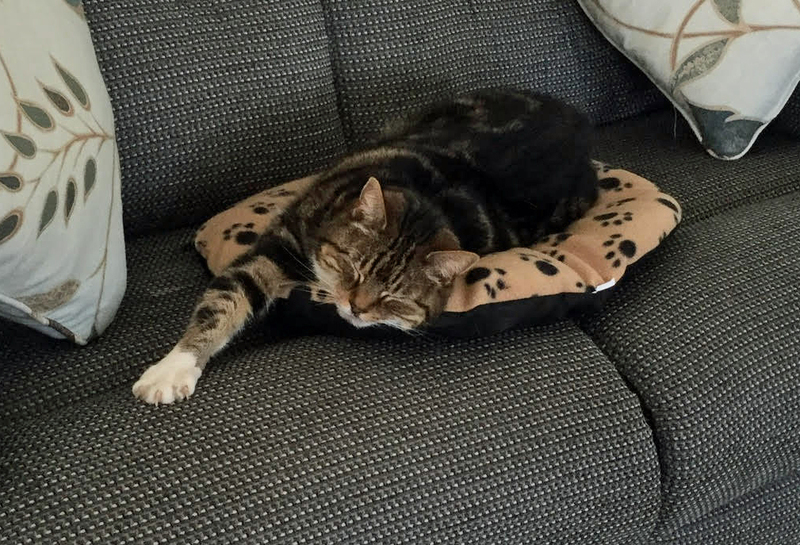 Adopting a mature moggie was the perfect choice for us and we would urge people to really considered doing the same. Understandably Bruce spent all of his first day with us underneath our sofa, so we've had a bit of a re-arrange so that all his needs are in one place where he feels safe. And soon after he felt happier enough to come out of his strawberry and eat his food in our company. Bruce has definitely come out of his shell in the last few days and is the most adorable lap cat anyone could wish for. Oliver seems to be settling in really well and we just love him! Well, we thought he was confident on day one but he now definitely rules the roost! He makes us laugh every day and we're always greeted with enthusiastic meows and cuddles. He loves it when we have people round because he has an abundance of laps to sit on and humans to pay him attention! We strongly believe that he's made of liquid because he just melts into your lap and snores very loudly. He is very happy staying indoors and doesn't even look out of the windows. The only time he goes near the front door is when visitors leave and he calls for a few minutes at the door after them! Edmund is so popular with all of our friends and family. We travelled to Wales at the weekend to visit Robbie's grandma and everyone fought to look after the cat while we were away!! 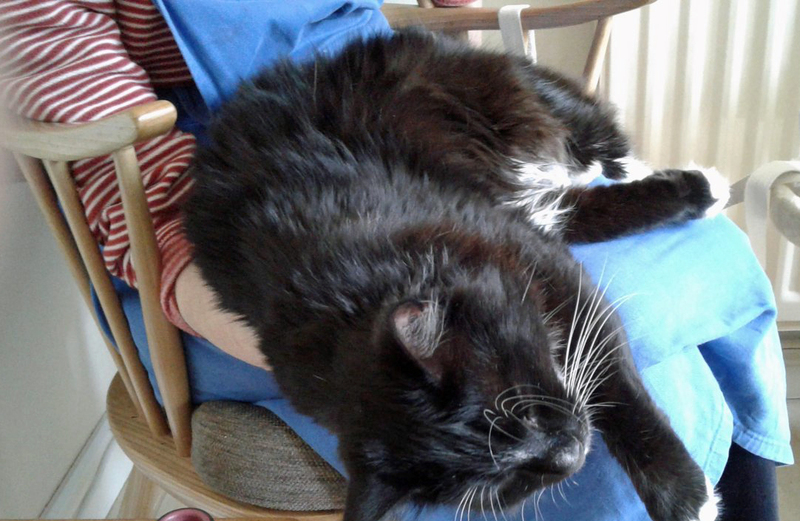 My mum comes round for a cuddle very often as her cat is totally indifferent but Edmund rather adores her. And of course we love him. 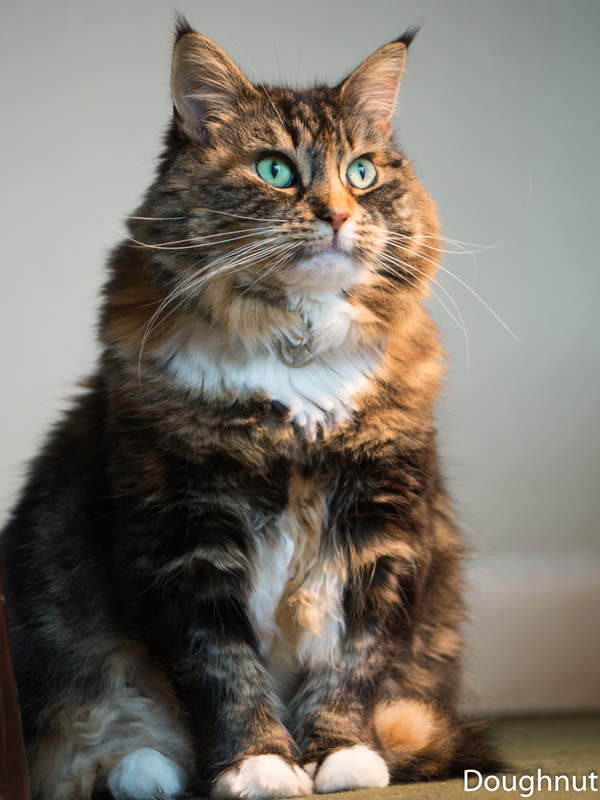 We feel so lucky to have such a friendly, characterful and intelligent cat in our lives. Talk about making yourself at home! 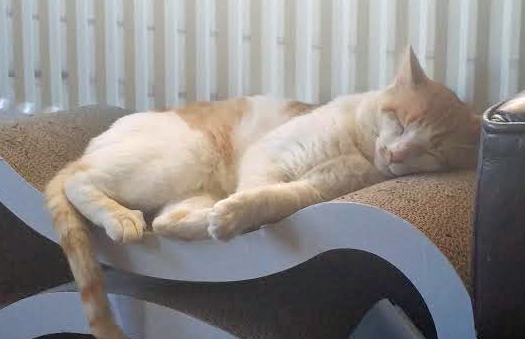 We have recently heard about 2 of our foster cats who settled into their homes within hours of arriving. First of all, Suki who - as you can see from the photo - is now in charge of deciding who sits where! 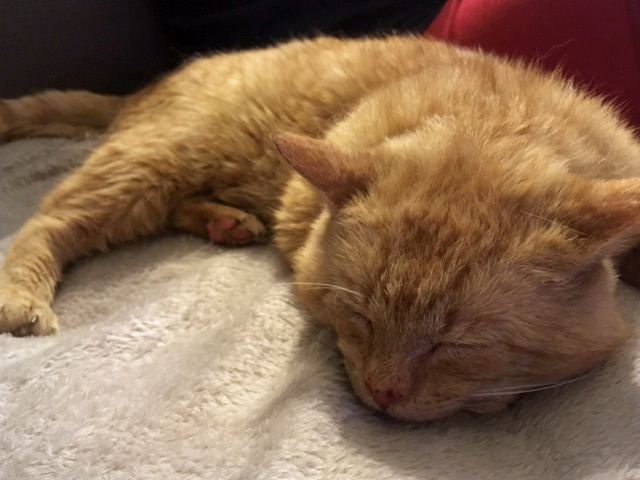 Also, a big fluffy guy who was called Mr Purrs, but now goes by the name of Toby, likes to control where his new family sit - ideally in a good spot so that he can flop on their laps!